New research suggests that Antarctica alone may contribute up to 1 meter of sea-level rise by 2100 and 16 meters by 2500. Along with other recent research, it points to a higher sea-level rise contribution from Antarctica than previously thought. Sea-level rise long has been one of the most worrisome and uncertain impacts of climate change. Rising sea levels threaten to inundate low-lying areas in a warmer world, and make more common devastating storm surges along the lines of those of Superstorm Sandy. In recent years, research offering estimates of how much sea levels would change during this century have evolved, and not for the better. Most past estimates of sea-level rise had been based on the thermal expansion of water, the melting of land-based glaciers, and the melting of the Greenland ice cap, with relatively little contribution expected from Antarctica. A new paper in the prestigious academic journal Nature now projects that Antarctica alone could contribute a meter – more than 39 inches – of sea-level rise by 2100 under the Intergovernmental Panel on Climate Change’s high-emission scenario, RCP 8.5. Along with sea-level rise projections from other sources, the research points to up to two meters, more than six and one-half feet, of sea-level rise by 2100, with potentially catastrophic consequences. This most recently published research paper is hardly the “final word” on the subject, but it’s consistent with a growing body of literature that predicts a much larger Antarctica role in future sea-level rise than previously projected. 1880 to present observed sea-level rise from tide gauges and satellite measurements. 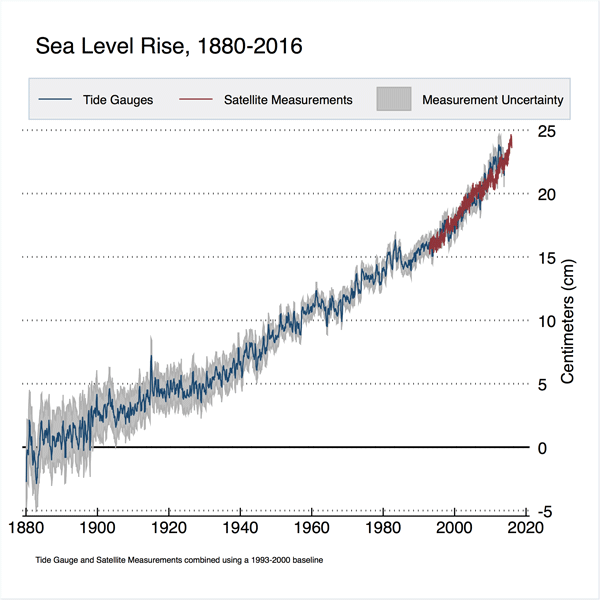 Since the 1880s, sea level globally has since increased by about 25 centimeters, nearly 10 inches, with some modest acceleration detectable in recent years. Scientists measure changes in sea level through a network of tide gauges around the world and, more recently, through measurements from satellite altimeters. The figure above superimposes data from both, with uncertainty measurements included for the tide gauge record. Among the most important changes in the most recent IPCC report was the decision to roughly double by 2100 the amount of sea-level rise forecast, from half a meter, about 19.5 inches, to a full meter, in the RCP 8.5 scenario. However, virtually all of that projected rise came from those three sources: thermal expansion of water (as warmer water takes up more area); land-based glaciers; and Greenland ice sheet melting. Antarctica was thought to contribute minimally to sea-level rise in 2100, as shown in the figure below. 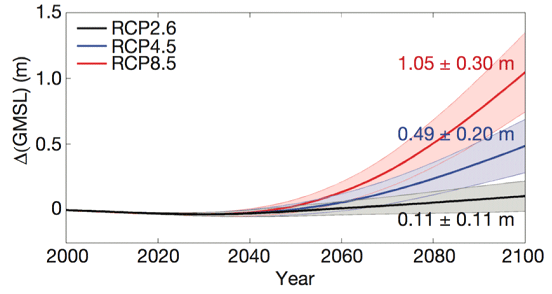 Predicted contributions to sea-level rise by source in the high emission scenario in the IPCC 5th Assessment Report. These results didn’t add up to some glaciologists studying how Antarctic ice sheets have behaved in Earth’s past. During the last interglacial period, known as the Eemian (about 120,000 years ago), the oceans were six to nine meters, 20 to 30 feet, higher, yet temperatures were only about 1.8 degrees F warmer than today. During the Pliocene, about 3 million years ago, with temperatures about 3.6 degrees F warmer than currently, sea levels were five to 20 meters – 16 to nearly 66 feet – higher than they are today. Evidence points to the Antarctic ice sheets as the primary contributor to higher sea levels in both periods. Existing models of ice sheet dynamics (including those used in the most recent IPCC report) could not explain this amount of sea-level rise based on temperature alone. In their new Nature paper, Robert DeConto, from the University of Massachusetts Amherst, and David Pollard, from Penn State, included two processes that prior ice sheet models had mostly neglected: hydrofracturing of buttressing ice shelves, and structural collapse of marine-terminating ice cliffs. Hydrofracturing of buttressing ice shelves refers to the breaking apart of ice sheets brought as meltwater and rainwater on the surface refreezes deeper in the ice sheet and breaks it apart. The structural collapse of marine-terminating ice cliffs occurs when tall ice sheets lose their buttressing ice shelves and vertical walls of ice collapse down into the ocean. The rapid decline in the Antarctic Amundsen ice sheet under a high emission scenario in the DeConto and Pollard model. Combined with warming temperatures, these factors show Antarctic ice melting far faster than in previous models, but they provide a good match for sea-level behavior during the Eemian and Pliocene periods. Under a high-emissions scenario, DeConto and Pollard predict that Antarctica could contribute one meter or about 39 inches to sea-level rise by 2100 and more than 15 meters, about 50 feet, by 2500. Under a modest emissions scenario, this sea-level rise would be cut in half in 2100 and by a third in 2500; and under a low-emissions scenario Antarctica would contribute relatively little to global sea-level rise. Predicted sea-level rise in the DeConto and Pollard model for a low emission (RCP2.6), medium emission (RCP4.5), and high emission (RCP8.5) scenario. The results from the new DeConto and Pollard study surely are dramatic and concerning, but they of course are not the “last word” on the subject, and no single paper or model should be seen as giving a definitive prediction of the future. For example, another paper in Nature in December 2015, by Catherine Ritz and colleagues, presented a model of Antarctic ice sheet dynamics predicting up to half a meter of sea-level rise from Antarctica in a high-emissions scenario. However, even this lower estimate points to a more general trend of research pointing towards increased estimates of Antarctic contribution to sea-level rise this century. It seems increasingly likely that the IPCC’s assessment on that point is unlikely to stand the test of time. 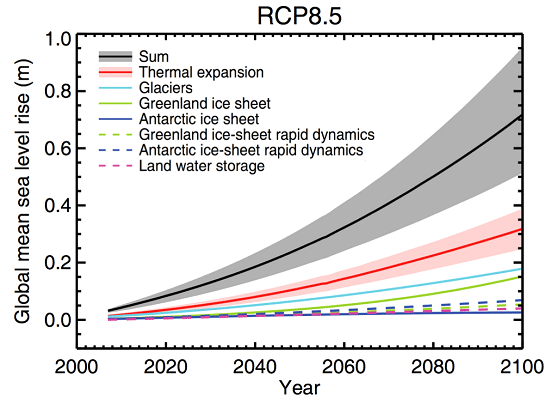 Predicted sea-level rise in the Ritz et al model for a high emission (RCP8.5) scenario. About 710 million people currently live within just meters of rising seas, and coastal urban areas are projected to attract more and denser populations in coming decades. Sea-level rise, perhaps more than any other climate-related impact, has the potential to dramatically disrupt those human civilizations in the coming decades and centuries. However, sea-level rise also can be somewhat managed and made less forgiving: A future emission trajectory limiting warming to 3 degrees C by 2100 would halve the increase projected; Keeping warming below 1.5 degrees C by 2100 could help keep sea levels manageable across many parts of the world.